Church of St John the Divine, Holme-in-Cliviger. Top Section of Gothic Cross-Head at St John’s. On display in the chancel of St John’s, at either side of the altar, are two sections of sculptured stonework – two parts that make up an ornate late Medieval cross-head of the 15th century. 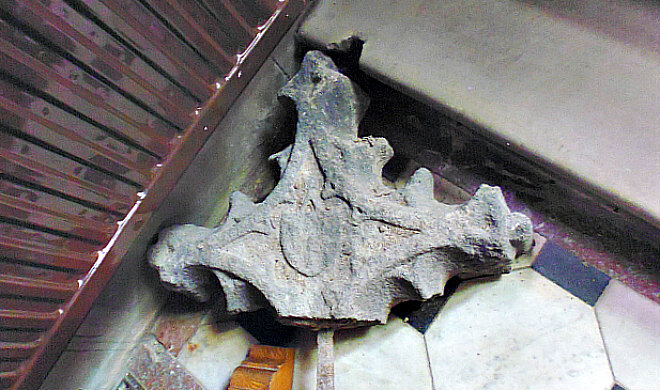 Originally the two sections were fixed together and stood on the top of a stone gateway at the south side of the church. In recent years the cross-head had become unsafe and so it was brought into the church. It has been described as ‘being in the style of Gothic’ from the late Medieval period. On the front the Sacred Heart with the five wounds of Our Lord’s passion affixed to a cross are depicted; the three cross-arms are intricately carved with crockets – while the lower stem goes down through a narrow arched shape with short, stepped crocketing to the sides of that. 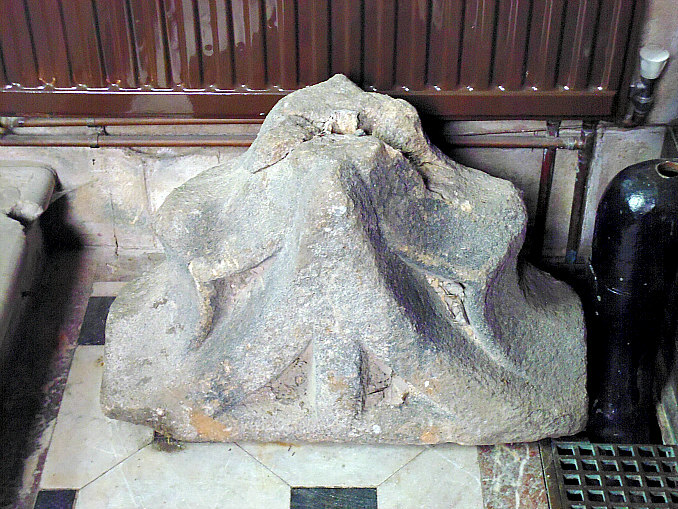 Bottom Section of Cross-Head at St John’s, Holme-in-Cliviger. It would seem that the cross-head was brought to St John’s from the ruins of Whalley Abbey, Lancashire, in the late 18th century by Reverend Dr Thomas Dunham Whitaker (1759-1821), an eminent historian, writer and antiquarian, whose family had lived for hundreds of years at ‘The Holme’ in Cliviger, and who was responsible for building St John’s in c 1790, at a cost of £870, which was “defrayed by the Whitaker family.” It is believed that two members of the Whitaker family had ‘actually’ resided at Whalley Abbey in the 15th century, but whether they were in hiding because of ‘their Roman Catholic faith’, we do not know. 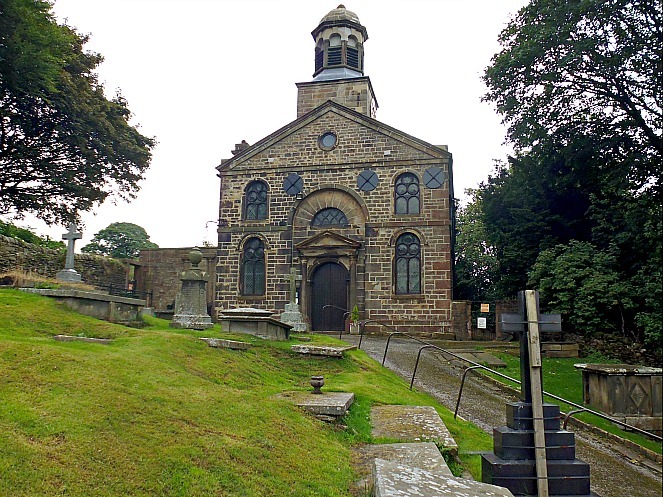 The church of St John is a beautiful sandstone building (in the Doric/Classical style) with parapet and a nice little cupola, or bell-turret, on its roof, according to the delightful work ‘All O’er t’Parish, by Peter Pomeroy & The Urban Studies Group of The Burnley Teachers’ Centre, 1983. St John’s was enlarged in 1897. It is a Grade II listed building. Also in this church there are two very beautifully carved 15th century oak misericord stalls, which again are thought to have been brought here from Whalley Abbey by Dr T. D. Whitaker. We also learn of Dr Whitaker’s great interest in what turned out to be a Roman ceremonial helmet and mask at Ribchester. This came to light when a child was seen kicking around a strange-shaped object. Whitaker arranged for the object to be taken for examination, and later it was found to be a highly decorated Roman artefact. A replica is on display in Ribchester Roman Museum, while the original is in the British Museum, again according to Peter Pomeroy & The Urban Studies Group, 1983. A fine bust of Dr T. D. Whitaker can be seen in St John’s church along with some wall tablets of the Ormerod and Whitaker families, a 19th century alabaster font and a painting of General Scarlett (1799-1871), the heavy brigade hero of Balaclava in the Crimean War, whose grave is in the churchyard. The present pulpet replaces an earlier three-decker pulpet and sound-board, which was apparently purchased in Leeds and was “perhaps” originally brought from the ruins of Kirkstall Abbey; the old pulpet having become dilapidated and unusable due to its age. Pomeroy, Peter I. & The Urban Studies Group of The Burnley Teachers’ Centre., All O’er t’Parish – A Second Stroll Around Cliviger, Lancashire County Council Library and Leisure Committee, 1983. Categories: Ancient Crosses, Misc Subjects | Tags: Church of St John The Divine at Holme Chapel in Lancashire | Permalink.